I love lemons! I love baking with lemons, decorating with lemons, using lemon-scented soaps and candles… and cleaning with lemons. Lemons are a frugal way to naturally clean and disinfect so many areas of your home — plus your whole house will smell lovely after you’re finished cleaning! 1. Pour 1/2 c. of lemon juice in the fabric softener cup (or add during the rinse cycle) and then hang your clothes to dry in the sun. 2. Add 1 c. of lemon juice to a sink or large bucket filled with hot water. Let clothing soak for a couple hours and then wash as normal. Clean your “grubby” looking brass and copper pans and fixtures by dipping half of a lemon in salt and rubbing it all over the discolored or dirty areas. Wipe with a damp cloth to remove any salt and then dry with a clean, soft cloth. Remove finger prints and hard water spots with ease by simply rubbing the cut side of a lemon over your stainless steel and chrome fixtures. Rinse with warm water and buff dry with a soft cloth. Plastic food storage containers can get pretty nasty looking, especially if you use them to store pasta sauce or other red foods. However, you can often remove those stains by soaking your containers in hot water and lemon juice — then scrubbing with baking soda as needed. Wash with warm soapy water and let dry. Our old home had very light laminate counter tops, and they were always getting stained. I tried so many different cleaning products and finally removed the stains by squeezing lemon juice on the specific areas and then scrubbing with a little baking soda. Disinfect butcher block counters and cutting boards by rubbing the cut side of a lemon over the surface and then wiping it down with soapy water. You can also remove stains from butcher block by pouring lemon juice over the stain, letting it sit overnight, and then wiping it with a damp cloth (repeat if necessary). Put 3/4 c. of water and 2 T. lemon juice in a small microwave-safe bowl. Microwave on high until boiling (usually at least 5 minutes). After the water comes to a boil, stop the microwave and leave the door close for about 10 minutes. At this time, you should be able to quickly and easily wipe down and food residue inside your microwave — plus your kitchen will smell lovely! After you’re finished cleaning with all these lemons, toss the rinds down your garbage disposal along with some ice and lots of cold tap water to clean and freshen. Add lemon to vinegar spray. I love cleaning with vinegar, but the smell can get to me after a while. So, I’ve started adding a Tablespoon or two of lemon juice to my 50/50 vinegar/water mixture in a spray bottle, and now it smells like spring every time I clean! The next time you head to the grocery store, pick up a bag or two of lemons and start cleaning. You home will look (and smell) fabulous. 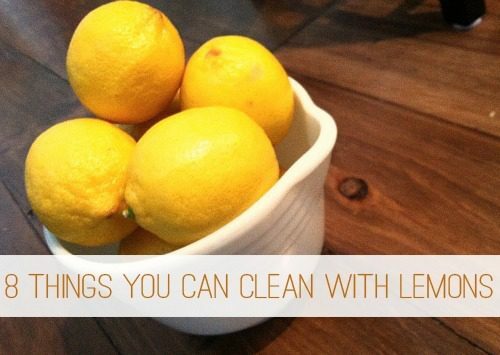 Do you have any other secrets for cleaning with lemons? Andrea Dekker is an avid list maker, pro diaper changer, farmhouse lover, and simple living enthusiast. Her goal is to simplify real life for real families with real budgets, real schedules, and real homes. Follow along at AndreaDekker.com. Join Us for a Party…A Spring Cleaning Party, That Is!